What’s it like homeschooling with a baby AND a toddler? And don’t forget that I have 2 preschoolers too. I often wonder what I’ve gotten myself into! I have found it relatively easy to get back into the swing of things after the baby is born. Babies are so snuggly and sweet (when they are sleeping) and they are easy to carry around when awake. Those first few weeks of multiple nap times make for some great homeschool time. I try to hit the ground running when the baby is small. True I might not have much sleep but I’m running on adrenaline. We just get right back into our routine – because I’ve greatly missed that routine and I need something normal in those sleep-deprived days. Those last few weeks (or months) of miserably large belly meant that I got very little things done. So, once I can see my toes again and get out of chairs without help, I’m ready to be back. After those first couple months, my energy starts to fade and I’m stuck in a never ending routine of nursing the baby and trying to get the baby to nap. Things start to slide then, but at least I feel slightly caught up with school. I always try to keep forging ahead. Once the baby becomes mobile and is a crawling machine, I usually fall apart and spend my time digging tiny pieces of paper or microscopic fuzz balls out of the baby’s mouth. The rest of my time is spent clearing a safe crawling pathway or rescuing the baby from under tables and chairs where said baby is stuck. And that’s when homeschooling gets hard! No amount of baby proofing and vacuuming can save me. I enlist my big kids to take turns playing with the baby. I gate up rooms and halls to keep the baby confined to safe area (and where I can keep a close watch). I wear the baby or carry the baby. I do read alouds while I nurse or I direct art projects from my comfy bean bag. I do as much school as I can during the naptimes. And I resort to bribing the baby with small snacks to keep her close. At least, that’s how I survived Ladybug’s babyhood. We’ll see how Punkin fares. She’s still not mobile yet. Ohh but homeschooling with toddlers. That’s when things get really tough. Toddlers are tiny tornadoes with built in sirens and a path of destruction as large as the house. This week I have removed Ladybug from the top of two different tables. I have taken away the tube of Desitin after she painted herself, her blankie, her baby, and her wall. I spent time searching for the toothbrushes after she hid everyone’s brush but hers. I have changed her outfit at least 3 times a day because she sneaked into the bathroom to play in the sink. I have bathed her after she covered herself in lotion. I bathed her after she painted herself with watercolors. I bathed her after she colored herself with markers. I bathed her after she had a diaper explosion. I’ve carried her around while I was trying to prepare meals because she decided she needed me right then. I’ve rescued my phone, computer, and iPad from her grubby little hands. I’ve hunted down the big kids’ iPods that she likes to hide. I’ve mediated hundreds of screaming matches when she decided that every item that anyone else was holding was suddenly hers. Basically, as soon as I get started with something, I’m interrupted by a toddler disaster. If she’s right in my face driving me crazy, I at least know she’s not off somewhere destroying something. And if the house is somewhat quiet and I’m getting some school work done with her siblings, I know that I am going to pay BIG TIME once I find her. 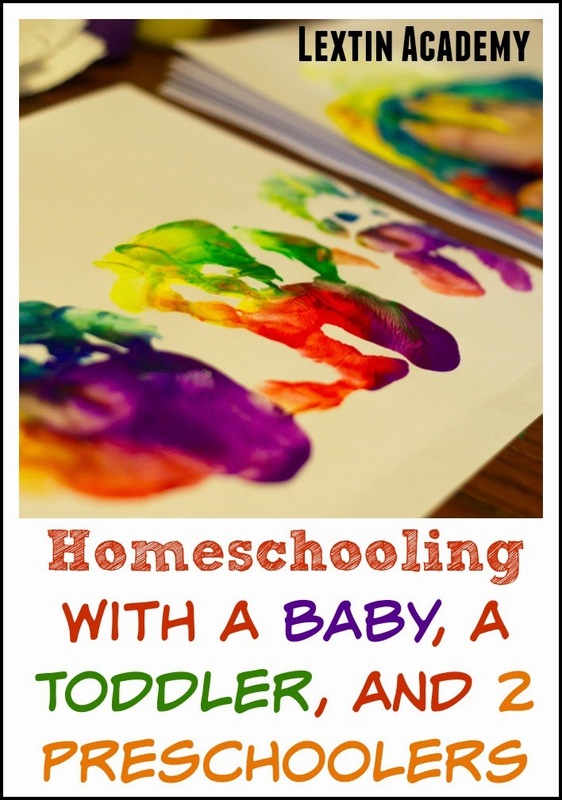 Homeschooling with toddlers…………it can be such a trial! But I have a few simple things that I’ve done to help me keep my sanity. I have multiple baby gates. I often gate Ladybug into a small area nearby so I can keep an eye on her. I assign older siblings the job of “Totschool” where they entertain Ladybug and watch her. I have canvas boxes of various building toys that I bring out during school time. I have a few bags of easy craft projects or little activities for her to do. I try to keep a few ideas of active play ideas in case I need a new activity. I know many moms have endless activity ideas and tubs and totes of toddler play ideas. I just haven’t been able to be that organized with our two moves this year and with being pregnant and then with a new baby. I fall into bed at night with the house a disaster and lesson plans not even begun. I do not have time to cut out, laminate, and create amazing Totschool activity trays for Ladybug right now. 1 ball of yarn and a pair of safety scissors – She will happily snip away for a long time! 1 bag of army men and our sink – She will wash those men until they shine! toy boats, cups, spoons, and our tub – She loves water play! I keep a pile of towels on the floor for my sanity! perforated plastic canvas sheets and colored yarn with the end taped – The yarn is her thread, the taped end is her needle, and the plastic sheet is her sewing canvas. large brushes, a cup of water, and paper – She loves to paint her pages with water and my table gets a good cleaning! baby wipes or damp rags – She will clean everything in sight with those wipes and I get very clean tables, desks, and cabinets! small makeup brushes – She will sit and do everyone’s “makeup” and hair while we read. I do have to watch her so she won’t poke our eyes out but she does a pretty good job! You don’t have to take time to put together elaborate activities. The simple stuff is usually the best. Ladybug could do those activities for hours and her siblings enjoy helping her. The clean up isn’t always fun but it’s much better than cleaning Desitin or lotion off of every surface in her bedroom. We made it through a year of homeschooling a baby and a toddler and we’re going to finish our work ahead of schedule. It can be done! But boy was it a lot of work! Oh yes, I remember those days well, though I wasn't homeschooling at the time and only had two. I can't imagine that extra work, Phewww lol You go, mommy!